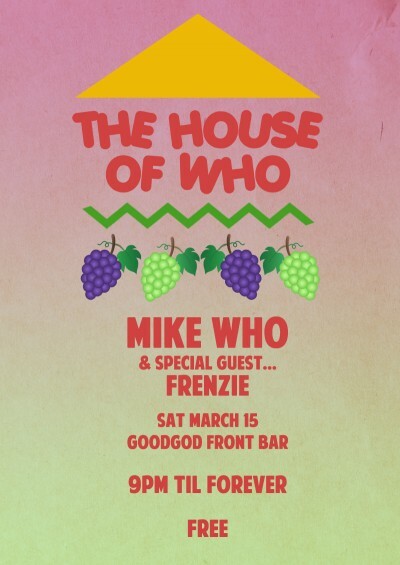 Sydney homeboy Mike Who’s monthly front bar jaunt comes round again this Saturday. This month’s special guest is local legend Shan Frenzie. Widely considered one of the countries finest DJ’s, Frenzie has done it all and more, with over 20 years in the game and crates that would make any music lover drool. The House of Who is an all night affair kicking off at 9pm and keeping the dancefloor heaving on a journey through Mike’s crates. Expect everything from Soul to Hip Hop, 80′s Boogie to RnB, Caribbean, African & Latin heat. Grab a pimms and lock while Frenzie and Who go b2b till the early hours of the morning. Free all night!